Local Plan Submission Version 'Soundness Consultation' Ended at 5.00pm on 29th January 2018. Draft Local Plan Consultation Ended at 5.00pm Monday 12th December 2016. See below for updates and further details. Regulation 19 (18th December 2017 to 29th January 2018). Below are the links to the detailed responses made to the consultation on the Submission Version of Local Plan (Regulation 19) by the Parish Council and Theydon Bois & District Rural Preservation Society. This Consultation closed at 5.00 pm yesterday. The Submission Version of the Draft New Local Plan is now available and the 'Consultation on Soundness' started on 18th December and will run until 5.00pm on 29th January. Responses which are submitted after 5pm on 29th January will not be considered. Please note you can only comment on the 'soundness' of the document. Not the selection as such. i.e. "why you consider the Submission Version of the Local Plan is not legally compliant, is unsound or fails to comply with the duty to cooperate". In accordance with Policy SP 2 the following sites are allocated for residential development in Theydon Bois: (i) THYB.R1 Land at Forest Drive – Approximately 39 homes (ii) THYB.R2 Theydon Bois London Underground Station car park – Approximately 12 homes (iii) THYB.R3 Land at Coppice Row – Approximately 6 homes. A total of 57 new homes in total. (See page 151 of Submission Document). This is of course a very substantial reduction on the 360 new homes that were originally proposed for our village so hopefully the strong representations made by us all during the original consultation had some effect. Some of these 57 proposed homes are still destined for precious Green Belt land though. If you made a submission to the original consultation then you should have received a letter regarding the 'soundness' consultation on the Submission Local Plan version, but the Submission Document and details are below. The Submission Version of the Draft Local Plan is available here. More information regarding the consultation is available on the EFDC website here. Our responses to the earlier consultation are here. A more detailed analysis of the comments was undertaken and a summary of the key issues identified was included as an appendix to the report considered by Cabinet on 11th July 2017. The full document is here as item 10 under the Agenda. The individual representations made during the consultation can be found here. The District Council is currently undertaking further site selection work as part of the progression of the Local Plan process. Arising from the consultation the Council has compiled a list of new sites that have been submitted for consideration by owners/land agents since the 2016 site selection process (i.e since 17 May 2016), amended sites where the boundaries have changed thus requiring further assessment, and sites withdrawn by the landowner / developer. These are being assessed and will be considered alongside the sites in the Draft Local Plan before the final set of sites for the Regulation 19 Pre Submission Plan is published. The District Council is continuing to progress with the Local Plan and related Evidence Base in preparation for the publication of Regulation 19 Pre Submission Plan. The Interim Report on the Local Plan Consultation was presented to the EFDC Cabinet Committee on 9th March and can be found online in the EFDC Agenda Reports Pack HERE (.from page 27). There appear to be a number of issues with the presentation of data in this interim report. There are a number of Pie Charts, but these seem only to have taken into account the ‘tick box’ returns and the returns without boxes ticked are given as ‘No Opinion’. This misrepresents the % of disagreement. e.g.Q6. Do you agree with the proposed sites in your area? Theydon Bois shows 74.8% as having ‘No Opinion’ when really the opinions are in their submitted text. The Theydon Bois & District Rural Preservation Society and Theydon Bois Action Group were two of only 15 ‘Interest Groups’ that responded from the whole of the district. TB&DRPS have the longest amount of main points raised listed in the document text, but they claim that some of their most important points are left out. It would seem there is a case of selective editing in this report. It appears from ‘reading between the lines’ that Theydon managed to get in the region of 430 people to respond to the consultation from a total of 3,300 for the district. This must be considered quite good as Epping, which is much larger than us could only manage about the same number. It seems our efforts to get a good turnout worked. It is hoped that when the fuller report is published it will give a fairer representation of the results of the consultation, which in the case of Theydon (discounting the ‘No Opinions’) really show that 95% do not agree with the proposed sites for our village. The Draft Local Plan Consultation officially end yesterday, but Theydon Bois & District Rural Preservation Society (TB&DRPS) has made an official compliant to EFDC with regard to the many problems reported to them by people who had tried to use the EFDC online response form and had to abandon it as it failed to work in a satisfactory manner. TB&DRPS have requested that the deadline is extended to enable people who had tried to use this form and failed close to the deadline time to respond by another route. Below are the links to the detailed Local Plan Consultation Responses made by the Parish Council (via their Planning Consultant), Theydon Bois & District Rural Preservation Society and Theydon Bois Action Group..
All the individual representations made to EFDC during the consultation can be found here. Above you will find the guidance Notes and and an extended version of the same notes that were produced by Theydon Bois & District Rural Preservation Society after the meetings with their representatives and those of the Parish Council and Theydon Bois Action Group together with the consultant employed by the Parish Council. These are a guide only. In your responses please refer to evidence, your own personal observations and experiences. Printed copies of the briefer version of the notes funded by TB&DRPS are being distributed to every home in the village by volunteers. Representatives of the Parish Council, Theydon Bois & District Rural Preservation Society and Theydon Bois Action Group met with the planning consultant employed by the Parish Council last Thursday to consider responses and objections to the EFDC Draft Local Plan and also how best to encourage as many of our villagers as possible to respond to this important consultation. It was agreed that it would be best to encourage as far as possible responses from people in their own words, but to offer some guidance notes with regard to possible objections particularly with regard to Theydon Bois. It was further agreed that based on discussions in the meeting that the Planning Consultant would draft some guidance notes for all of the nine questions being asked by EFDC and it was hoped that these response notes would be agreed by the above representatives and approved at the full Parish Council Meeting next Thursday 24th November. They would then be made available from this website as well as distributed as quickly as possible by any other means available to us including possibly door to door. A reasonable number, but not as many people as expected, turned up for the Parish Council's Meeting on Thursday 10th November about the EFDC Draft Local Plan Consultation. Parish Council Chairman John Phillip, who is also the EFDC Councillor who also as Portfolio Holder Planning has responsibility of the Draft Plan gave a presentation outlining the proposals in the Draft Plan and what EFDC were trying to achieve. He gave particular emphasis to the proposals for Theydon Bois. John and Councillor Peter Gooch then answered questions and took opinions from the audience. Residents and Theydon Bois Interest Groups TB&DRPS & TBAG raised a number of considered and important questions about the draft proposals for Theydon and the delivery of the plan in general. The general opinion of the meeting was that the 360 homes proposed for Theydon (a 23% increase in the size of our village) was excessive and would seriously damage the character and rural setting of our village and should be opposed. Councillor Gooch and Phillip urged all villagers to respond to the consultation with their opinion and as much evidence as possible. Councillor Gooch advised that the Parish Council had already employed a Planning Consultant, who had given an initial opinion and he said the next step would be a meeting of the Consultant and Parish Council Representatives along with Representatives from TB&DRPS & TBAG to formulate a response for the consultation. It was also hoped to give some guidance to Theydon residents for their own responses on this Local Plan Page ASAP. 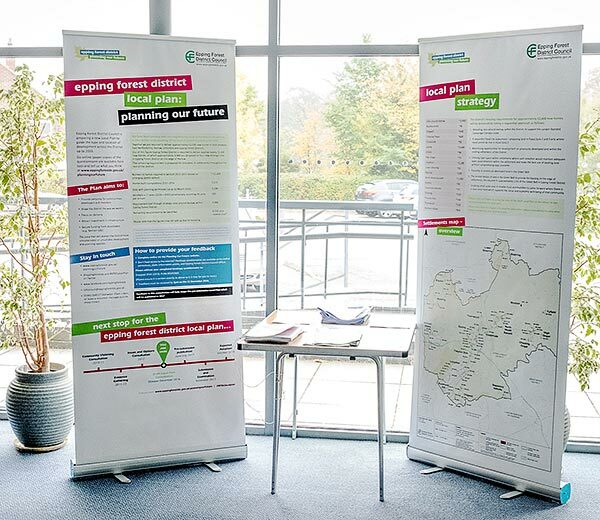 The static unmanned EFDC Exhibition about the Draft Local Plan Consultation is now in the foyer of the Village Hall and can be viewed during hall opening hours, which are normally most days and weekday evenings. Thursday 10th November. (See below). The Online Questionnaire Response Form is now available on this EFDC Planning Our Future Website Page and a sections of the Draft Local Plan page is HERE. A pdf of the full 380+ page document of the Draft Local Plan can still be found in the EFDC Cabinet Agenda Reports Pack HERE. (also see 30th Sept. below). 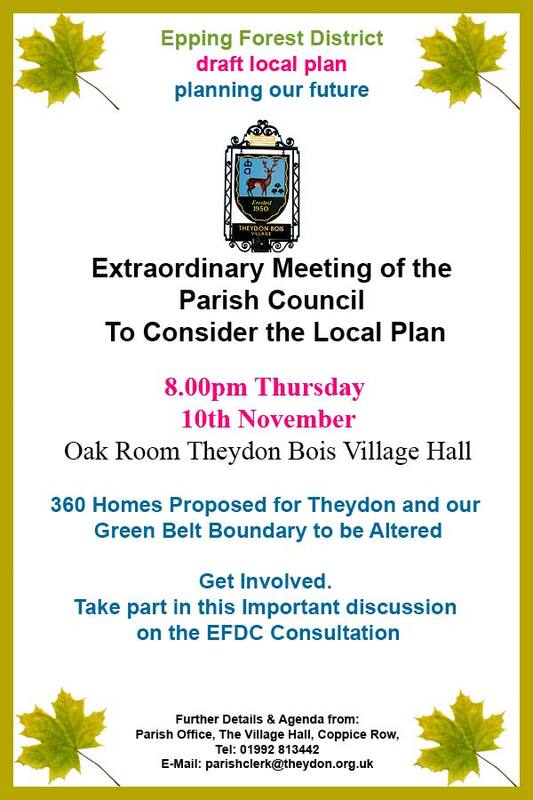 31st October 2016: EFDC Local Plan Consultation: Extraordinary Meeting of Theydon Bois Parish Council to discuss the Local Plan proposals. Please try to attend this meeting to take part in the discussion on the proposals that will determine the future of Theydon. Below is a preview of the nine questions in the Draft Local Plan that you can respond to if you wish. You do not have to make a response to each question and you can add additional comments separately. Do you agree with the overall vision that the Draft Local Plan sets out for Epping Forest District? (See paragraph 3.26, Chapter 3). Do you agree with our approach to the distribution of new housing across Epping Forest District? (See Draft Policy SP 2, Chapter 3). Do you agree with the proposals for development around Harlow? (See Draft Policy SP 3, Chapter 3). For the two town centres and four district centres in the District the Draft Local Plan sets out a proposed primary shopping area which is intended to protect and encourage retail uses (See Draft Policy E 2 and Section 5 – Places). Do you agree with the proposed shopping areas? Do you agree with the proposals for new employment development? (See Draft Policy E 1, Chapter 4). Do you agree with the proposed sites in your area? (See Chapter 5) Do not feel that you have to comment on all of the areas. Do you agree with the approach to infrastructure provision being proposed in the plan? (See Chapter 6). An Interim Sustainability Appraisal has been commissioned to support the Draft Local Plan. We would welcome any comments you may have on this. (See Technical Document page). Do you wish to comment on any other policies in the Draft Local Plan? The above links are to the full Draft Local Plan Document, the Theydon Bois section (page 41 of pdf / page number 157) and the Guidance Notes and Extended Guidance Notes that were produced by Theydon Bois & District Preservation Society in collaboration with the Parish Council and Theydon Bois Action Group from an initial draft supplied by the Planning Consultant employed by the Parish Council. We hope they will encourage and aid Theydon Bois residents residents to make their own response. There is also a downloadable Questionnaire in Word to help you produce a draft response before submitting or to use as a posted response if you do not have the EFDC version. There are nine questions you can respond to in the consultation if you wish (see above). When making your response if you wish you can just answer some of the questions. Think before you responding ‘No Opinion’ though as this might be interpreted as ‘No Objection’. Also you do not have to use the tick boxes set out by EFDC and ticking these may allow an incorrect quick judgment by EFDC in comparison to your following more considered answer. Please only use the ‘Guidance Notes’ above to help you make an informed objection in planning terms. Please do not copy and paste them as answers. It is possible that if you do they will be seen as multiple entries and discounted. It is also important to include your name and address details for the same reason as anonymous contributions will not be accepted. Please try to write in your own words including your own local knowledge and thoughts on why this proposal would be so harmful to Theydon Bois. In particular your own experience and evidence of the present infrastructure problems would be very relevant. Epping Forest District Council (EFDC) has a re-editable ‘On-Line Response Form’ on their website here: http://eppingforest.consultationonline.co.uk/feedback/ where you can make your answers, but you are not obliged to use this. You can get a hard copy of the questionnaire from the council offices in Epping, send them an E-Mail or write a letter. These must not be anonymous if they are to be valid. Write to Planning Policy Team, Civic Offices, High Street, Epping, Essex, CM16 4BZ. Some hard copies of the questionnaire are available from the Theydon Bois Parish Office and if these are returned to the office by 11th of December the Parish Council will transfer them to EFDC by the closing date. 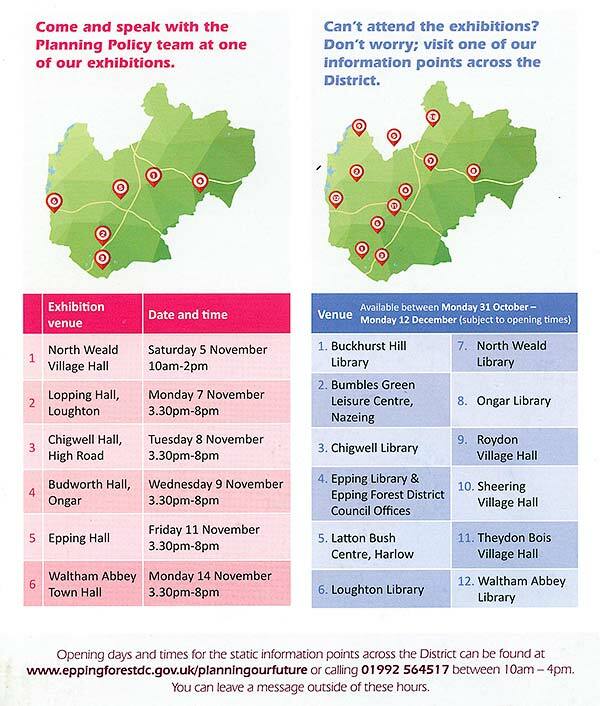 Residents and councillors have their first chance to view an advance version of the draft Local Plan before Epping Forest District Council’s Cabinet meeting on 6 October 2016. The plan, available to view on the Cabinet agenda from 27 September, is subject to change at Cabinet and the meeting of Full Council on 18 October 2016. Only once agreed with any further amendments at Full Council will the draft be ready for public consultation from Monday 31 October 2016. EFDC have just launched a set of Web Pages regarding the Consultation on the New Local Plan that indicates how they will be publicising the consultation and promoting the Draft Local Plan. These pages should include a link to the Draft Local Plan document from the 18th October, but it is possible that it will be available earlier than this date. You can sign up on the Consultation Home Page for e mail updates or join the EFDC Twitter feed from there. EFDC now indicate that the draft Local Plan will be in the public domain up to five weeks before formal consultation starts in late October. Planning Portfolio Holder Councillor John Philip said the advance availability would effectively give local residents 11 weeks to consider the draft with responses being received in the final six week period. Epping Forest District Council (EFDC) has reached the next step in our Local Plan, and will soon be asking for your input and feedback. With a renewed emphasis from Central Government on the need for every district to have an up-to-date Local Plan in place in 2017, EFDC has been working hard towards the next stage of the draft Local Plan. The draft Local Plan will outline the proposed strategy for the next 17 years to meet the economic and housing growth in the district, identify potential sites for development and regeneration and set out the proposed development management policies. “At the heart of Epping Forest District’s draft Local Plan is your feedback". The consultation will be launched on 31 October 2016, subject to the draft Local Plan receiving full Council approval on 18 October 2016, with draft documents available on the Council website from 28 September 2016. There will be a number of ways to get involved in this stage of the draft Local Plan, access relevant information, and provide your feedback. Dates and locations are being finalised but look out for further information in a Local Plan Update newsletter that will be issued district wide, a new Planning Our Future website, and the council’s Twitter and Facebook feeds. The new Planning Our Future website will ensure that it is easier and more convenient for you to provide the council with your feedback online. Your local representatives will be briefed about the Draft Plan and the consultation process as final details are secured to ensure that they are able to direct you to all of the information you will need to take part in the process. “This is your Local Plan. This is our opportunity as a community to ensure development in Epping Forest District takes place how and where we want it to. "This plan is a balance between the requirement from Government to deliver the identified and evidenced need for economic and housing growth, but ensuring it is delivered in as sensitive, sustainable, and fair a way as possible across the whole district. Not much news seems to be coming out from EFDC on how the work on the Consultation is progressing. We have though heard that a number of cabinet agenda items on details of the consultation have been postponed. EFDC still have the below as the Timetable for the production of the New Local Plan. The EFDC latest Issues & Options Page is Here. Our District Councillors representing us are John Philip and Sue Jones. John Philip also has a website with information. 16th October 2012 Update: This EFDC Consultation has now closed. The closing Date for Responses was Monday 15th October 2012 at 12 Midday. A 100 printed or hand written completed full responses were received at the Parish Office and forward to EFDC before the deadline. 51 people signed up to the 'residents response group response' that was also forwarded. 60 people downloaded the full Consultation Document directly via this page. 228 people downloaded the Guidance notes in Word Document format from this page. 162 people downloaded the Guidance notes in PDF format from this page. 111 people downloaded our own Word questionnaire/answer form rather than the problematic EFDC ones. Hopefully most of these also resulted in submissions to EFDC. Theydon Bois Parish Council and Theydon Bois & District Rural Preservation Society detailed submissions to the Issues & Options Community Choices Questionnaire are now available for you to view from the links below. The Theydon Bois Action Group submission available from the link below to the home page of their web site. Below for reference only. Deadline for responses now past. Confused by this Consultation? We Can Help You Respond. Epping Forest District Councils Consultation Document 'Planning Our Future, Issues and Options for the Local Plan is a very important document that is the first step in formulating the new Local Plan that will shape the future of Epping Forest District including Theydon Bois over the next 20+ years. Theydon Bois Parish Council, Theydon Bois & District Rural Preservation Society, Theydon Bois Action Group and Theydon Bois Village Design Association believe it is vitally important that as many village residents as possible respond to this consultation. This page and its links aim is to assist Theydon Bois Residents in making a response to the consultation. 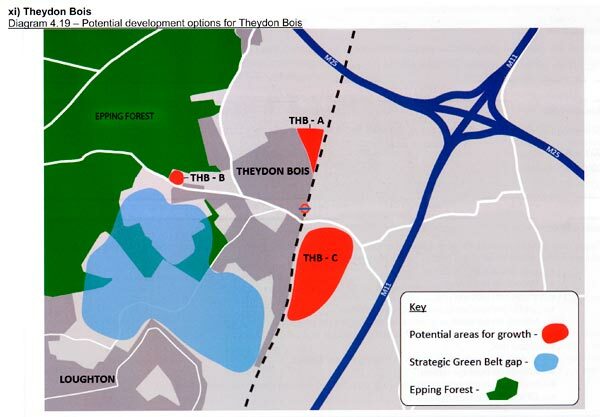 The above map shows the growth options being considered for Theydon Bois in the EFDC Consultation Document printed copies of the document are available from the EFDC offices in Epping or copies are available for viewing in the Parish Office or in most Libraries. A Community Choices Questionnaire for responses accompanies the document available as a Word Document here or a PDF Version here . It can can also be be completed by registering online here . There is further information and associated documents available from the EFDC page here. Theydon Bois Parish Council, Theydon Bois & District Rural Preservation Society, Theydon Bois Action Group and Theydon Bois Village Design Association all believe it is important to oppose all the suggested growth options on the above map as they will be detrimental for the future of Theydon Bois. They will all be submitting their own detailed responses to the Issues and Options Consultation. At the request of many Village Residents they have jointly agreed some Guidance Notes with Basic Model Answers (you can download these from the links below) to aid residents in submitting their own responses. Please try as far as possible to put these guidance answers into your own words as then your individual response will carry more weight. If you just wish to agree this Guidance you can sign up to a Group Theydon Bois Residents Response available in the Parish Office, but individuals answers are preferred. 9th October Update: Please note we have now found that EFDC's online form and their questionnaire are difficult to complete on computer and give errors. We recommend that you either complete with a pen after printing or you can edit and use our Word Answer letter below. This has the Guidance notes answers already included, but please change the answers into your own words as then your individual response will carry more weight. EFDC are willing to accept answers or letters that do not use their form. These can then be sent by freepost or email as listed below. Printed copies of the Guidance Notes with Answers are also available from the Parish Office. The TBAG Website also carries the above information. DEADLINE: is 12 noon on Monday 15th October at the EFDC Offices in Epping. Parish Office by 10.00am on 15th October will be forwarded to EFDC to meet the 12 Noon Deadline.